Potentially dangerous small space rocks are smashing into the Moon a lot more often than was expected, according to an ongoing NASA study. 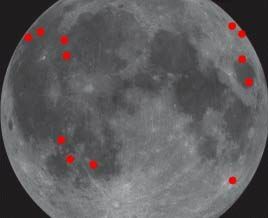 "We've now seen 11 and possibly 12 lunar impacts since we started monitoring the Moon one year ago," said Bill Cooke, head of NASA's Meteoroid Environment Office. "That's about four times more hits than our computer models predicted." If further study proves the pace to be accurate, it could figure into plans for putting people on the Moon, according to a NASA statement issued today. A collision with a spacesuit or a habitation module, even from a small object, could be fatal. Most meteoroids that enter Earth's atmosphere burn up harmlessly. The bulk of shooting stars are caused by stuff no bigger than sand grains and a few pea-sized objects. But even something as big as a basketball will usually burn up, in a spectacular fireball, before hitting Earth's surface. The Moon, with no atmosphere, sees it all rain down. Cooke and colleagues spotted a very bright lunar impact last December. They documented two impacts during last month's Leonid meteor shower. "The flashes we saw were caused by Leonid meteoroids 2 to 3 inches (5 to 8 cm) in diameter," Cooke said today in a NASA statement. They hit with energies equal to 150 to 300 pounds of TNT. Leonid meteors, leftover chunks from a comet, are particularly dangerous because they move against the path of our own orbit around the Sun, so we hit them head-on at greater speed than much other debris. This results in a greater release of energy at impact. "We need to spend more time watching the Moon," Cooke said. "With more data, we can draw stronger conclusions about the impact rate."